SW light breeze, mostly sunny. Still good numbers of waders at Revtangen, and we operated 9 walk-in traps and 7 clapnets from 10-20. Ringed: Dunlin 125, Red Knot 24, Little Stint 3, Sanderling 67, Common Redshank 7, Turnstone 10, Common Ringed Plover 10, Common Starling 10. Total = 256. Ringmerket: Myrsnipe 125, polarsnipe 24, dvergsnipe 3, sandløper 67, rødstilk 7, steinvender 10, sandlo 10, stær 10. Total = 256. 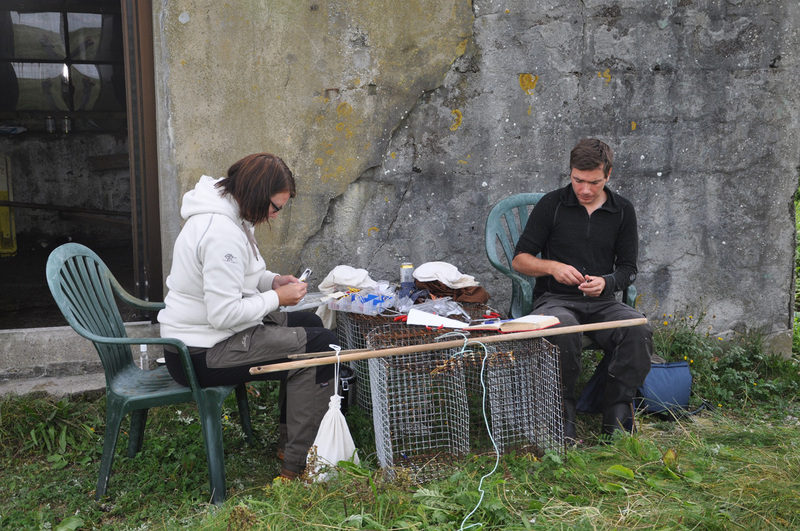 Wader ringing at the outdoor office at Revtangen. Part of the 150 or so Sanderling flock frequenting the north beach at Revtangen today. 7 walk-in traps were sat to catch these and other waders on the north shore, and an astonishing 67 Sanderlings were caught! Sandløper og myrsniper. Renate Berg, Espen Helgesen, Haavard Husebö and Alf Tore Mjös. 16 students and a teacher from Bryne VGS came along for a ringing demonstration.